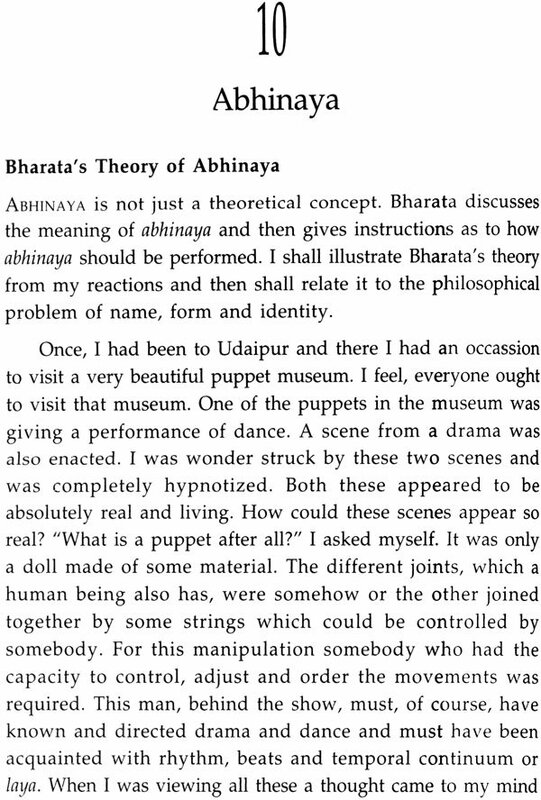 The foundation of the Indian aesthetic theory can be traced to Bharatamuni's Natyasastra where he give his theory of beauty (theory of rasa) which was later elaborately developed by learned scholars. 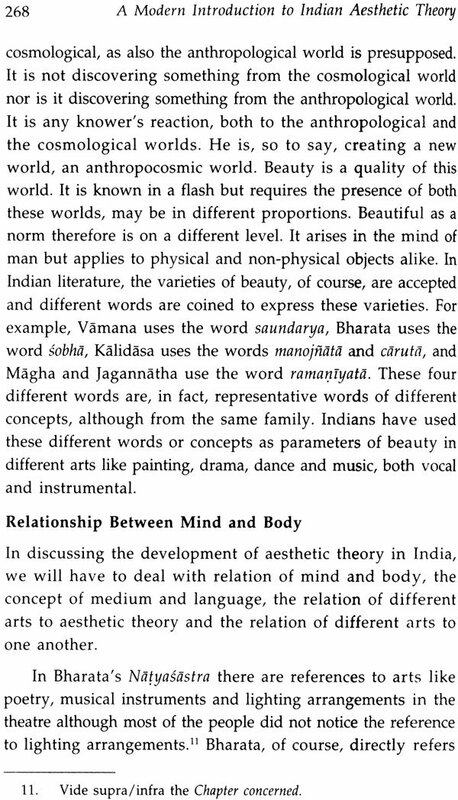 In this work, Prof. Barlingay examines the development of the rasa theory by various authorities on art and aesthetics and finally presents his own critical understanding of it. The volume begins with a survey of the history of Indian art by examining painstakingly the relation between art and beauty, perception of time and space in art, and classification of arts. It then plunges into a detailed study of origin and development of rasa theory: from rasa in the Vedas and Upanisads to Bharata's rasa theory and perspectives of Abhinavagupta, Bhattatauta, Bhatta Lollata, Kuntaka, Dandin, Mammata, Vamana, Rudrata, Visvanatha, Bhamaha, Jagannatha and others who enriched it further with their own theories. It explains how principle were employed and re-employed by the masters to reveal various meanings, inter-relationships, symbols, and perceptions of art. It highlights the salient features of each master's unique manner of interpretation of art concepts. The work is a must for scholars and students keen to study the fundamentals of concept and theory of Indian art, particularly with reference to drama and poetics. Prof. S. S. Barlingay (1919-1997), a reputed name in teaching and research on philosophy, was founder-editor of several scholarly journals. He was a teacher of philosophy at prestigious universities within Indian including the universities of Delhi and Pune, and at the Perth University, Australia and Zagreb University, Croatia. He published numerous books on logic, ethics, epistemology, aesthetics and political philosophy. He was the chairman of the State Board of Literature and Culture of the Government of Maharashtra. Tradition holds that all enlightened activities lead to ultimate liberation and enlightenment. The study of beauty and aesthetics is one such. There is beauty in art, sculpture and poetry but most of all in the participatory fine art of drama. In drama there are three components: the playwright, the actors and the audience. It has long been held that the operative principle is rasa, the flow from the author via the dramatic personae to the audience. What is the nature of this rasa? Is it a fluid that originates in the author's work or is it generated only in the performance itself? These have occupied many scholars in the past and various theories have been advanced. Most notable amongst them are Bharata, Bhamaha, Abhinavagupta, and Jagannatha. Professor Barlingay's authoritative treatise surveys criticially the contributions of various authors and provides a basis for determining what is aesthetics in the Indian tradition. Despite the advance of the social sciences, biology and the physical sciences, we continue to live in a familiar "realistic" world, and there are those who have been able to penetrated this veil and recognize a deeper reality. It is this realm in which rasa function. We do have persistent distortions of reality: we know that matter is made of molecules which themselves can be composed of smaller sub-units in perpetual motion, and that we have to use the quantum physics laws to describe it properly. Studies in psychology have made us realize that there are periods of qualitatively different clear perceptions. Despite these, we cling to the traditional world-view. This persistence of misperception is evident in everyday phenomena. We see the sunrise and the sunset and wax lyrical about their beauty. We see our image in a mirror and, knowing how the virtual image comes about, we "perceive" the image. On a hot day we see mirages on the city roads. Our perception of heat or cold is dependent upon what was the ambience in which our skin was earlier. The clear conviction that causality is fully operative in nature is not completely in accordance with our retrospective view; what appeared as accidental is recognized as inevitable in retrospect. Spiritual disciplines are usually prescribed for going beyond appearances. The inadequacy of our "realistic" view is recognized when we have advanced in such disciplines. But art in general and drama in particular show us a deeper reality beyond appearance. When Ophelia wanders the fields in desperation on seeing Hamlet fully preoccupied with the murder of his father, our eyes fill with unshed tears even a we recognize it is only a play. We see that Kanva Maharsi's sorrow at parting with his foster daughter Sakuntala is incongruous with his detached world-view but we feel it when we watch the play enacted. These are the plays of rasa and it is an experienced reality. Barlingay also deals with the repeated participation in the play; but unlike the athlete running around a track, we gain each time and "see" the play: we "see" more than we did before. So each enactment of a play is a new experience and not merely a repetition. Familiarity with the story and the structure of the play only improves the enjoyment of the rasa. In the present book the author presents carefully the spirit of the various authorities and clearly distinguishes their view from his own critical understanding. In the way we get the various streams of Indian thought. This authoritative treatise is thus scholarly and at the same time an initiation to elicit the reader's own personal experience. The critic is often thought of as a secondary contributor to the art. But it may be that their view is mistaken: in science a deep understanding of what has been the crystallized views of various authors is an invitation for the individual scientist's own discovery and insight. And the moment of insight is an extraordinary yet familiar state of awareness filled with awe, joy and timelessness. I believe that to be equally true of literature and drama. We are not mere onlookers but participants who function in an altered state of awareness. 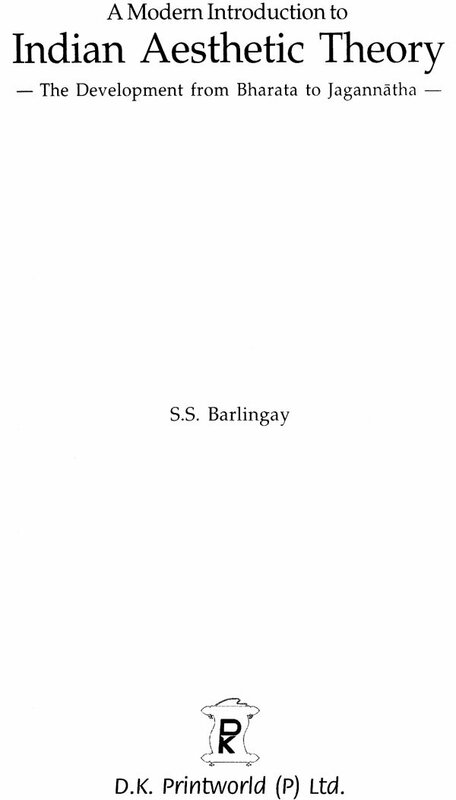 I knew Professor S. S. Barlingay only for a few short years but was profoundly grateful to be able to share ideas with him. I will miss him, like so many of you; but this excellent book will be with us for the present. 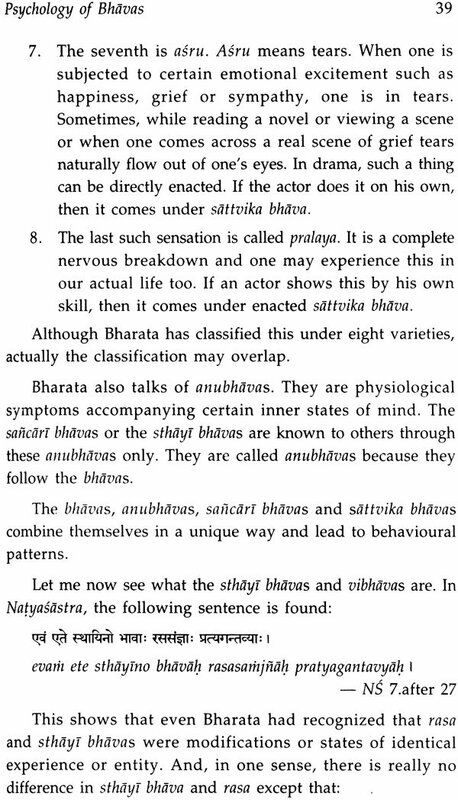 In all probability, Bharata's Natyasastra is the first systematic work on drama and poetics in India. Of course, it might not be a work of a single author. It could be a compliation of works of Drhina, Vasuki, Bharata, etc., and Bharata himself might not have been one single person. It could be the name of a "tradition" and one could talk of Bharata as one talks of Vyasa. 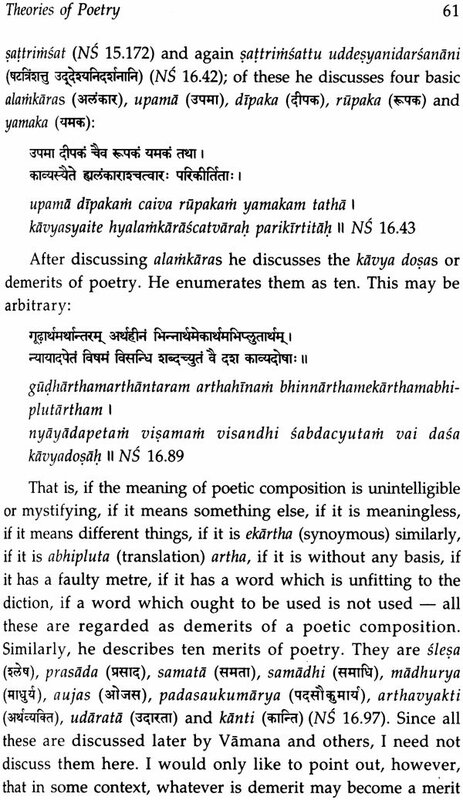 Some modern scholars have made some original observations in this regard and have come to the conclusion the Natyasastra has not been the work of one author. Late Narhar Kurundkar and Dadegaonkar have come to such conclusion. I appreciate the research, but for my purpose I regard the work or the compilation as one single unit, albeit with many interpolations and extrapolations. 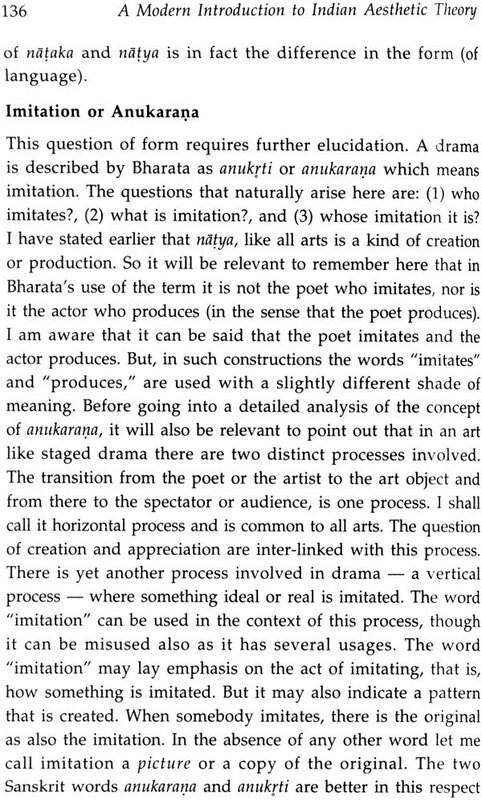 I take this view because when Natyasastra was composed or compiled, it aimed at giving one cogent, coherent theory of art in general and drama in particular. That is why the compilation was made. Since who composed the work ( the Natyasastra) does not affect my work, I take it as one unit, of course, after due selecting and editing. The study , which I am presenting in this monograph, is of the nature of discussion of the language and parameters employed by those who developed our tradition in music, drama, dance and poetry on the one hand, and painting, sculpture and architecture on the other . The parameters used were basically regarding the subject matter and evaluation of the art objects. In the course of time, however, the parameters used in literary arts were also employed for evaluating painting and architecture. The keywords in regard to these art forms were rasa, saundarya and ananda. The word rasa was used, to begin with, for determining the status and standard of the subject matter of that art.1 But , while describing this concept (of that particular art) , foisted on rasa were layers of "evaluation (and satisfaction)," which follow the accomplishments of the art object. The object of art is to communicate, and for such communication two things are necessary. One is the medium and the other is the message conveyed through this medium. These two elements are evidently different, but many a time, they cannot be separated. They are like a copper wire (which is a conductor of electricity) and the electric current which flows through the wire. 2 This artistic communication is for understanding the message which one wants to convey to the other. It is hrdayasamvadi,3 that which is of the nature of blending two hearts, agreeable to two hearts . This communication stands for artistic beauty. All parameters of art are the parameters concerning the scale of beauty (and also communication). But, sometimes all such parameters used for measuring and evaluation breakdown when the audience or spectators or readers reach a state of "silence" or speechlessness. This is the state of affairs which cannot be describe at all and was, therefore, regarded as anirvacaniya. 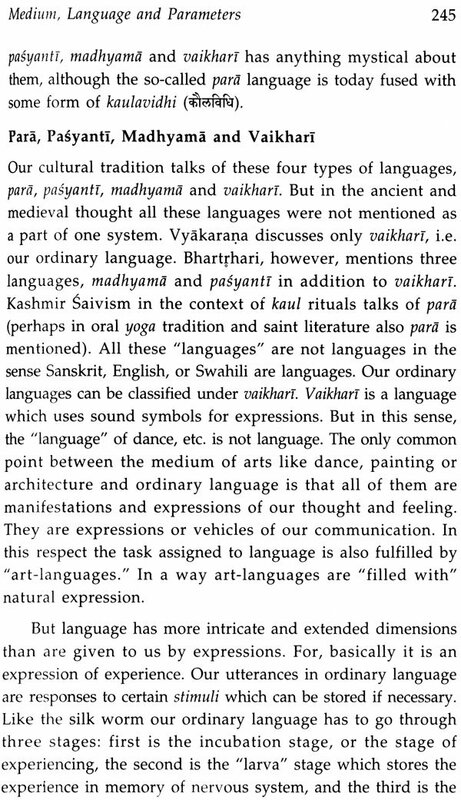 The highest type of daiviki siddhi which Bharata describes is of this type. Such a state of affairs was compared to Brahmasvada, the flavour arising from the experience of Brahman. 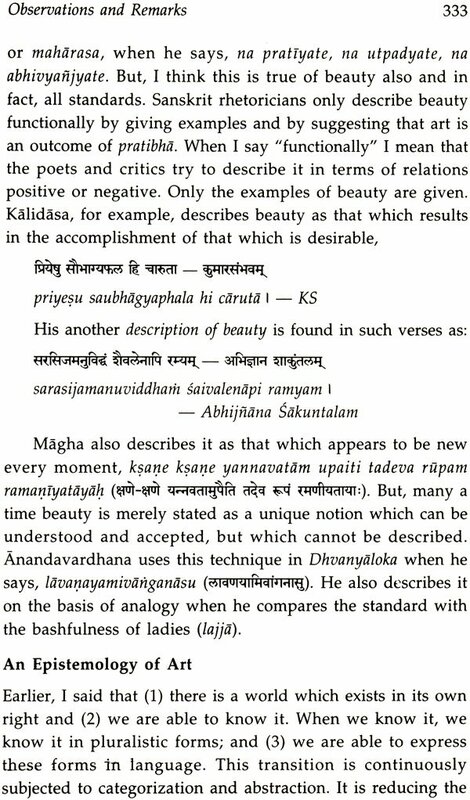 Bhattanayaka and, following him, Visvanatha used this expression for describing the art–experience. The history of the art of Indian origin shows that this theory came to light while developing the stage as performance. 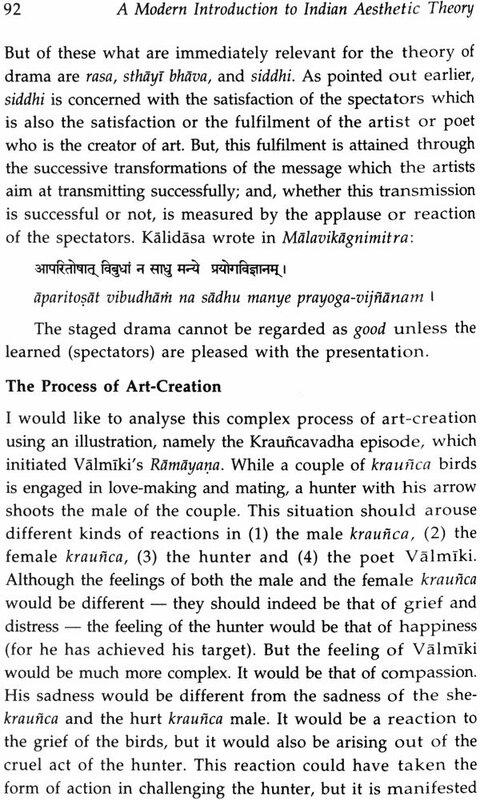 The stage drama has several dimensions: (1) first is the script, presented in the form of an imitation of life; (2) it requires the medium of expression or bhava and acting ; (3) this has to be done in a specific style; and (4) finally, it is to be evaluated in the form of the applause or otherwise from the audience . It has thus all the characteristics of any art, whether it is dance, music, painting, sculpture or architecture. Perhaps on this account, the theory of drama became a paradigm for all art-critics and the concepts in drama were employed and re-employed in different arts. They were, for example, employed in the criticism of poetry. Drama requires a continuum of time and deals with a medium. There is some media among a medium in different arts. For example, a medium in poetry and the medium of drama. 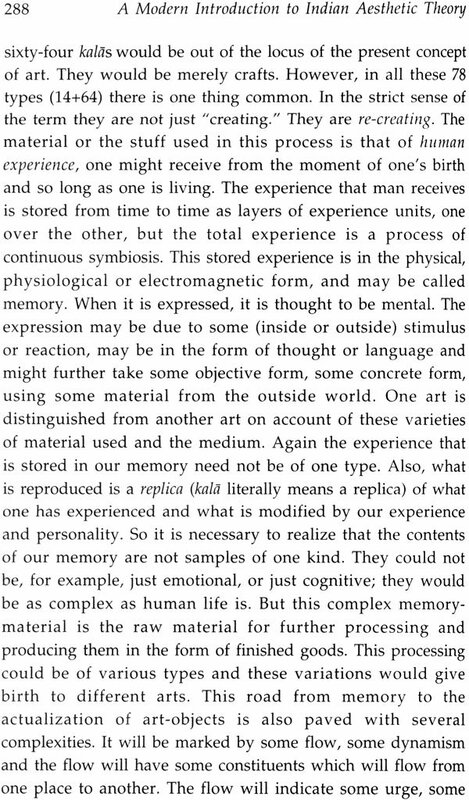 The general characterstics of these media are also the characterstics of language whether they are of the nature of memory or concepts, or the material of which the art object is made. 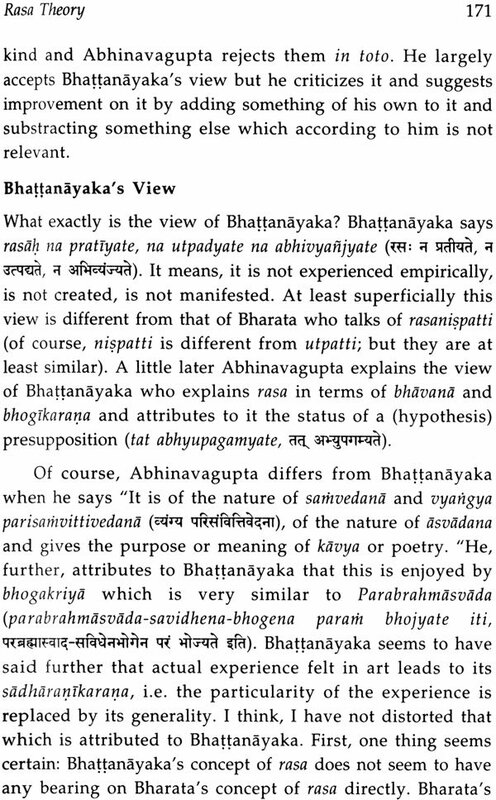 Bharata's treatise, Natyasastra, discusses this. But several refinements came from time to time in understanding and developing the art theory in general. We find six types of theories developed in the course of time. The theories of alamkara, riti, vakrokti, dhvani, rasa and aucitya can be mentioned in this context. As it appears to me, they are theories of poetry. But they can be used in all departments of arts, including music, painting, sculpture and architecture.